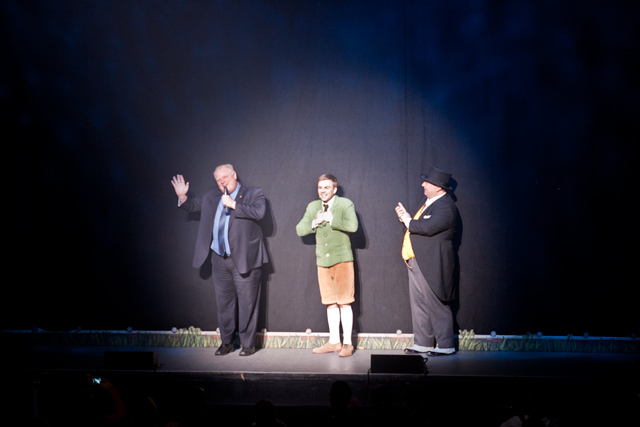 Rob Ford joined Sir Topham Hatt (right) and his grandson on stage at the Sony Centre today. Photo by Dean Bradley/Torontoist. In one of his stranger pop-up appearances, Rob Ford walked across the stage at the Sony Centre this afternoon during a production of Thomas Saves the Day—a live-action Thomas the Tank Engine performance. And, no, there was no mention of gravy. The story: Thomas and his friends are hosting a lantern festival on the island of Sodor, and a storm has blown away all the lanterns. It has also knocked down the bridge to the island, and guests can’t get to the festival! But one visitor has made it: Mayor Ford of Toronto. Standing in front of a black curtain, Ford walked on in a suit, took the microphone, and said little more than “thank you” and “hello” to the crowd of children who were much more concerned with how little Percy was going to haul rocks back from the big quarry. Sir Topham Hatt explained that since Ford was “not afraid of hard work,” the mayor was going to help the trains find new decorations for the festival. Ford then walked off stage and into the audience to sit down with his family—including his daughter, who is apparently an avid Thomas fan. Adult audience members gave very mixed reviews. Some thought it was “fabulous” and showed Ford participating in public life, while others thought it was “totally inappropriate” for Ford to come to a children’s performance. Others didn’t really see the point of his appearance or thought he would say or do something more dramatic. As for the kids, none of them even registered that someone other than the regular cast of Thomas characters had walked across the stage. Though Ford’s choice of venue was a bit misguided, he could have harnessed all the hype and just had fun. Instead, the mayor made the moment a bit more awkward by appearing much less charismatic and compelling than the booming Sir Topham Hatt. But, hey, even if he disappointed most of the expectant crowd, his daughter will probably be talking about this for years.